Surprise! It looks like a cropped top and skirt but it’s actually a one-piece dress. It’s my take on the Adèle pattern by Anne Durrieu, an impulse purchase as soon as I saw it on Julie’s Instagram feed. 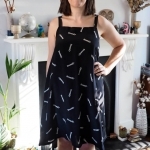 I’ve been wanting to self-draft this sort of dress for ages but never got round to it, so for a £6.50 PDF I thought I’d take a punt on an unknown-to-me French company. 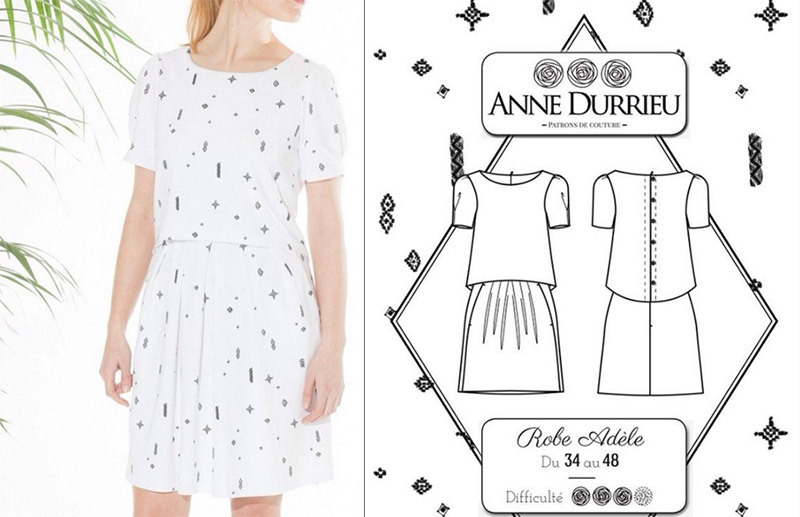 Anne Durrieu seems to make and sell rtw clothing as well as selling the patterns to DIY them, and this is their second dress pattern release. 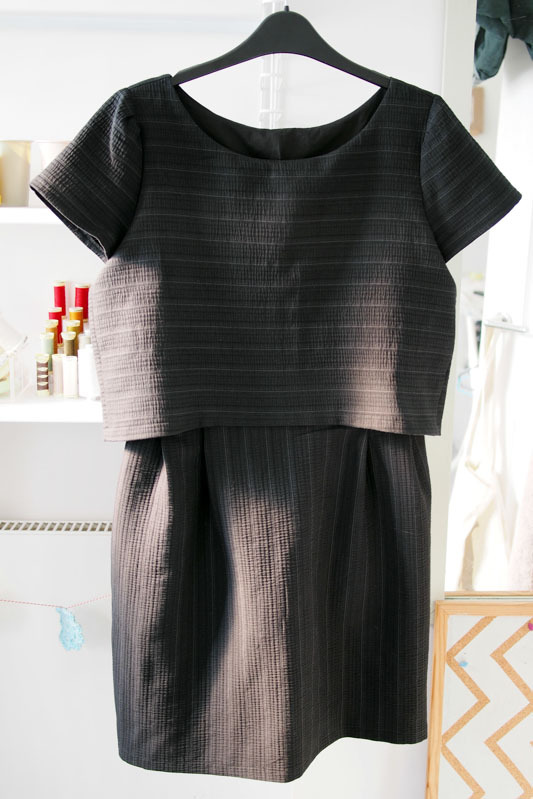 For a dress that looks quite clean and simple there’s a lot going on. 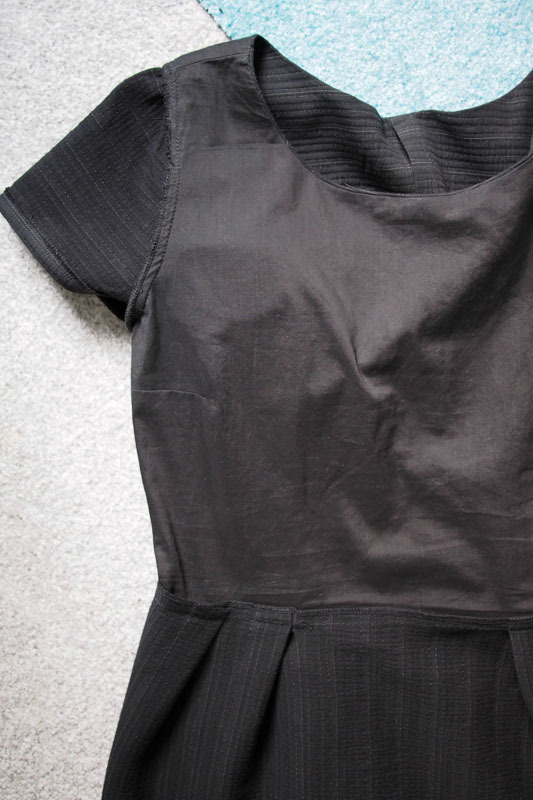 The skirt attaches to the bodice lining only, leaving the swingy outer bodice loose over the top. The outer bodice is joined to the lining at the neck and both are attached together at the armsyce. The back of the outer bodice has a slightly curved hem and buttons up the back. 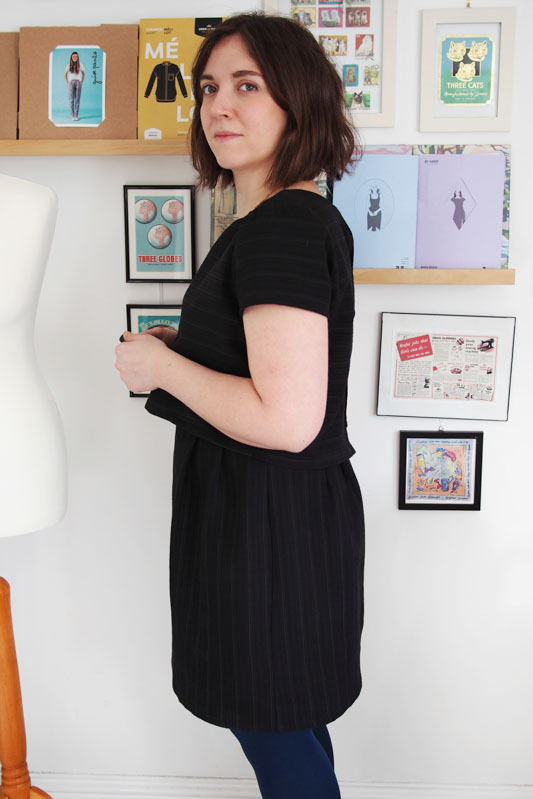 There’s bust darts in the lining, pleats and darts in the skirt, and there’s an invisible zip in the underlayers to fasten it. If that sounds pretty complex… it was, ha ha. Now factor in that the instructions only come in French! The diagrams weren’t that helpful and Google translate did not prove insightful, so I was on my own with the construction really. I tried as much as possible to reverse-engineer it ahead of time but my unpicker still took quite the workout: I think the waist seam came out four times before I got it right. The lining acts as a semi-lining and semi-underlining, leading to even more ‘which is the right side? !’ confusion and unpicking. The good news is it fitted nicely off the bat. I can typically tell now if I’m going to have to alter the fit just from looking at the bodice pattern piece, which is handy. 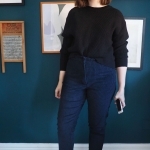 The neckline and sleeves in particular are a nice shape and very comfortable. I cut size 40 graded to 42 but ended up taking it in a bit at the waist and hip so might go for a 38-40 next time. The main fabric is a fairly thick and spongy seersucker from Ditto with a woven-in stripe, and the lining is a black cotton sheeting. I picked easy to work with fabrics to mitigate the tricky construction, but I do think something a touch lighter and drapier would work better. It’s a bit heavy for spring. 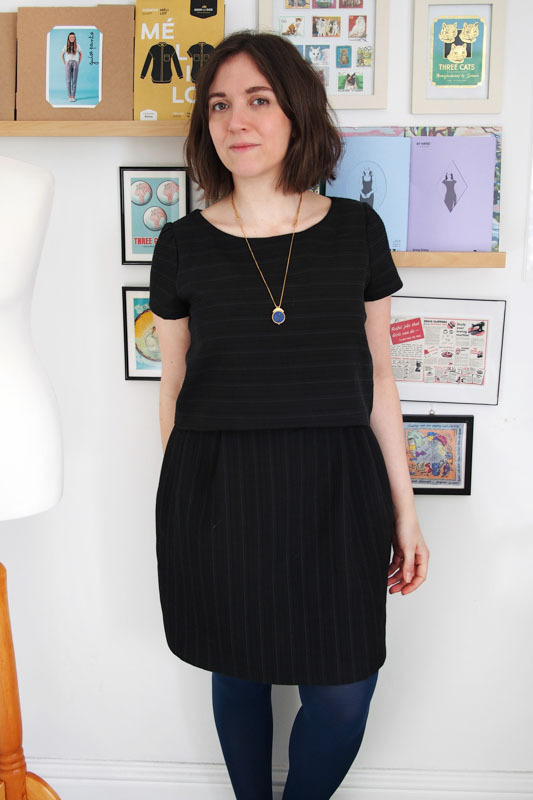 – …which involved redrafting the skirt, because the side seams of the skirt and lining are designed to not match up. 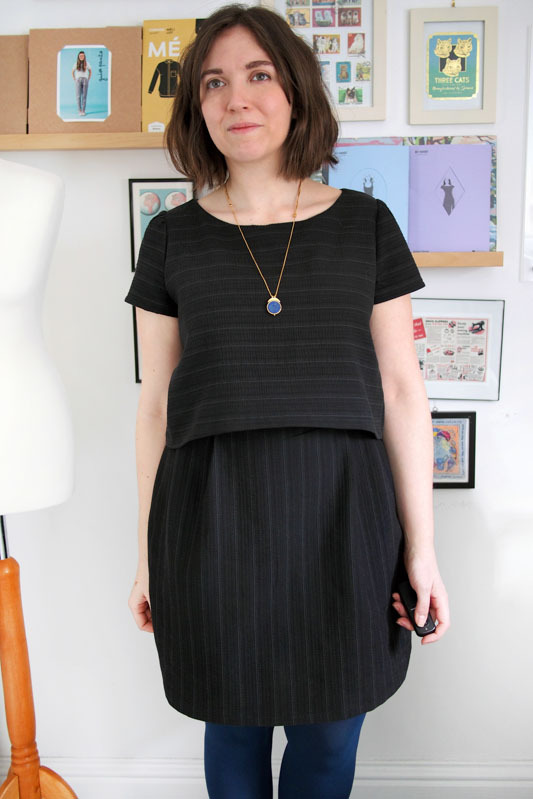 I made the front skirt narrower and redrafted the pleats and darts to suit. If I were to make this again it’d go much faster now I’ve wrapped my head round the construction! Despite what seemed like a lot of fiddling to make it work, I’d still recommend the Adèle pattern if you like the style and feel like a challenge because it’s a neat little 25-page PDF and seems to be well-drafted. I fancy one in a jersey knit with an elasticated waist, and I can see it in a more spring-appropriate colourful rayon print too. I love this! 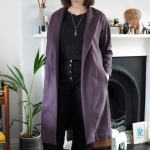 I wonder if I could make a long sleeved version for winter… hopefully by the time I’ve sewn up all the Republique du Chiffon patterns I have in my queue the French instructions won’t be so scary! You could probably swap out or lengthen the sleeve easily enough. I have used a few other French patterns but none as complex! I think something like this, but with perhaps a stretchy jersey lining, would be the holy grail of breastfeeding friendly party dresses. Yeah, could be, as long as you can get under the lining layer too. It’s a great style, and it looks great in the seersucker. Well done for persevering with the French instructions. Wow! 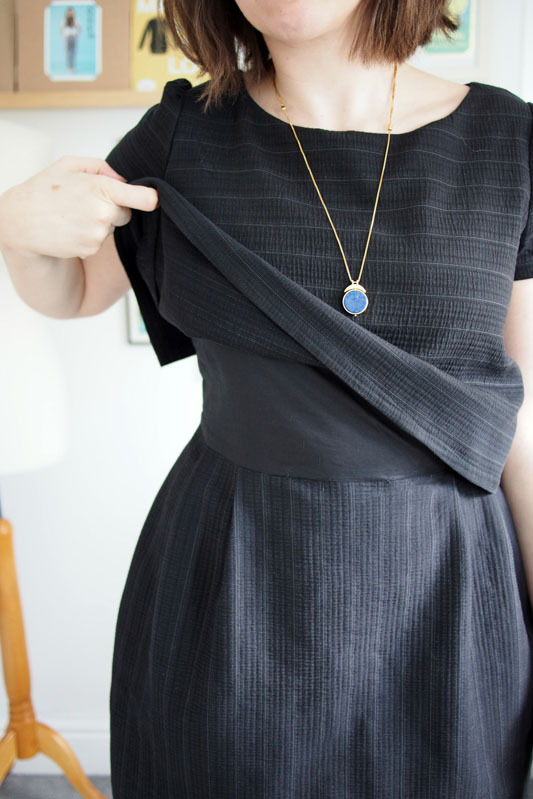 I really love this and have also fancied something similar for a while (Sezane do similar dresses). Sounds quite a challenging make, but looks like it was worth it! It’s gorgeous. Thanks! I like Sezane too, the French get a lot right. I love it! 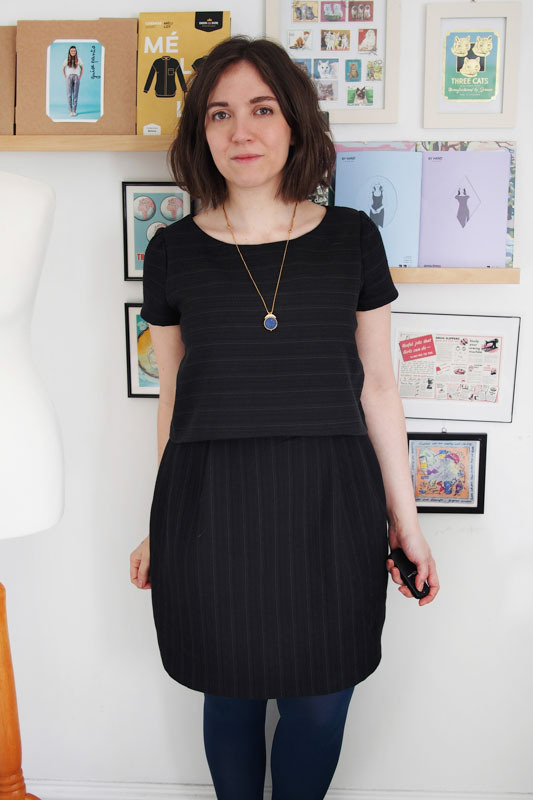 I’ve seen some vintage dresses that have a similar look, and have always been drawn to them. Great job, and I like your short sleeve proportions – very nice. Thanks! 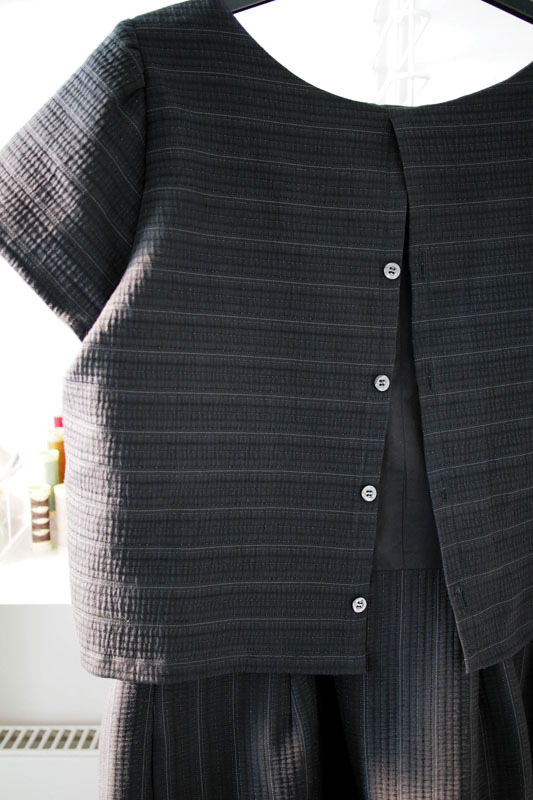 I love the sleeves – small thing but a very satisfying detail to get right in terms of design and comfort. I do like the structured fabric up top to give the overlay some shape, but not sure it’s the most flattering on the skirt for us pears! This is gorgeous! Well done on making this dress. I think it would be too fiddly and time consuming for me to make though. The sewing itself wasn’t hard, just the thinking time! It took a weekend of sewing on and off. I love it! 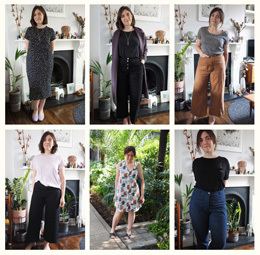 I always like what you make, I think your style is similar to mine, after reading your review of a pattern I often go on to make it myself – you’re my personal pattern tester ha! And needless to say, you version is a beaut – love the seersucker! Hurrah! I was wondering what to do with this seersucker too and it seemed a good match. It can handle a fabric with a bit more structure. Love the shape of this and the back especially. I don’t know if I’m brave enough to try French directions though. Maybe if I make it again I’ll photograph the trickier bits! Intriguing. Love the finished dress. Hope you get around to making more to put all the changes to use! Definitely will, got two fabrics queued up! Love it! My sewing capabilities are not quite at that level yet however! Intriguing and rather fabulous. You’ve done a great job with it. I can see it on you! I reckon you could definitely figure out the construction. I’ll write some tips when I make my second one. Fabulous! I love your fabric choice. This is one of those patterns I would have totally overlooked had it come across my path but looks amazing once constructed. Looks like I’m going to have to hunt this one down. What a great version! I love it in that seersucker. I’ve seen a couple of French bloggers’ makes of this – I like it, but was put off by the lack of seam allowances – you have my admiration:). I grew up on Burda but am so spoilt now with built in s.a. that unless it’s for a knit fabric( meaning I can use my cutter and seam guide) I won’t get a pattern without them. I really liked her first pattern too – she is a winner of the French Project runway or something like that. I speak French, but one tip I can give you re instructions – if you have any Deer & Doe patterns, their instructions are bilingual – they helped me to make out certain incomprehensible directions when I first began buying French patterns, as my French was not sewing oriented till a while ago:). Seam allowance is easy enough to add! I didn’t know she was on a TV show, that’s funny. That is a very good tip, thank you! This sounds super tricky and complex, but your dress looks awesome! Did you feel really satisfied when it was done? I love the button back and it definitely looks like something you would wear a lot. Ooh! This is cool! What an interesting construction! What a cute and interesting pattern! I like how you used the stripes! Beautiful, I love the back! You are such a talented sewer!